In September 1999, FIDIC introduced its new Suite of Contracts, which included a “new” Red, Yellow, Silver and Green forms of contract. The “new” Red Book was intended to replace the 1992 fourth edition of the Red Book, with the ambition that its use would cease with time. This ambition has not materialised and is unlikely to do so in the future. Despite the importance of the 1999 Forms, there has been very little published on the new concepts adopted in them and how they interact with the previous forms. This important work considers these aspects together with the many developments affecting the fourth edition of the Red Book that have taken place since 1997, when the second edition of this book was published, and relates them to key contracting issues. It is written by a chartered engineer, conciliator and international arbitrator with wide experience in the use of the FIDIC Forms and in the various dispute resolution mechanisms specified in them. · five new chapters in this third edition, the first four chapters deal with each of the 1999 forms and the fifth chapter is confined to the topic of Dispute Boards. Part I Background and Concepts of the Red Book;. Chapter 1 Background of the Red Book. 1.2 The First Edition of the Red Book. 1.3 The Second and Third Editions of the Red Book. 1.4 The Fourth Edition of the Red Book. 1.5 The 1996 Supplement to the Red Book. 1.6 Concepts of the Red Book. 1.7 The New Suite of FIDIC Contracts. Chapter 2 The Red Book is based on a domestic contract. 2.2 Diversity of legal systems. 2.3 The applicable law in international construction. 2.4 The applicable law of the contract. 2.6 Law governing enforcement of awards. 2.7 Grouping of the contemporary legal systems. 2.8.1 Sources of law in the Romano-Germanic group. 2.8.3 Areas of the law affecting construction in the Romano-Germanic group. 2.9 The common law group. 2.9.1 Sources of law in the common law group. 2.9.2 Areas of the law affecting construction in the common law group. 2.10 The law in Islamic countries. 2.10.1 Sources of Islamic law. Chapter 3 Legal concepts based on the common law system. 3.1 The law applicable to the contract. 3.3 Some specific concepts under the common law. 3.3.1 Substantive law and procedural law. 3.3.2 Legislation, common law and equity. 3.5 Contract – general principles. 3.5.1 Prerequisites of a contract. 3.7 Performance of a contract. 3.8 The contents of a contract. 3.9 Remedies for breach of contract. 3.11 The responsibility to complete. Chapter 5 The concept of a trusted independent engineer. 5.1.1 FIDIC's Statutes and By-Laws and the independent engineer. 5.1.2 FIDIC's Code of Ethics. 5.1.3 FIDIC's Quality-Based Selection, 'QBS'. 5.2 Other suppliers of consulting services. 5.3 Services provided by the consulting engineer. 5.3.3 Design, preparation of documents and supervision. 5.3.4 Specialised design and development services. Chapter 6 A traditional re-measurement contract. 6.1 Factors governing choice of contract. 6.2 The allocation of essential functions. 6.2.1 The allocation of the function relating to finance. 6.2.2 The allocation of the functions of design and construction. 6.2.3 The allocation of risk, quality control and the method of pricing and payment. 6.3.1 The Red Book is a re-measure contract. 6.3.2 Contracts with a bill of quantities. 6.3.3 Contracts with a schedule of rates. 6.5.1 The Supplement to the Fourth Edition of the Red Book, Section B. 6.5.2 Main Features of FIDIC's Form for Payment on a lump sum basis. Chapter 7 Sharing of risks. 7.2 The definition of 'risk'. 7.5 Allocation of risk and their management. 7.6 Allocation of Risks in the Red Book. Chapter 8 The concepts in practice. 8.1 The Red Book in use. 8.2.1 A relationship of trust. 8.2.2 The role of the engineer. 8.2.5 Absence of a legal system. 8.3 EIC/FIDIC survey of 1996. 8.4 A brief summary of Part I. Part II The Fourth Edition: A Commentary. Chapter 9 The revisions - purposes and consequences. 9.2.1 Definition of 'Engineer' under group (a). 9.2.2 Definition of 'tests on completion'. 9.2.3 Definitions under group (e). 9.2.4 Definitions under group (f). 9.2.5 Definitions under group (g). 9.3.4 Express requirement for impartiality. 9.5 Sub-clauses 6.1, 6.4 and 65. 9.11 Sub-clauses 14.1 and 14.3. 9.21 Clause 34 and 35. 9.31 Clause 53 and 54. 9.34 Sub-clauses 65.4 and 66.1. 9.37 Other changes made in the 1992 Reprint. Part III The Fourth Edition in Practice. Chapter 10 Role of the engineer. 10.2 The engineer as a designer. 10.3 The engineer as the employer's agent. 10.3.1 Authority and duties of the engineer. 10.4 The engineer's proactive duties and authority. 10.5 The engineer's reactive duties and authority. 10.6 The engineer's passive duties and authorities. 10.7 The engineer as a supervisor. 10.8 The engineer as certifier. 10.9 The engineer as adjudicator or quasi-arbitrator. Chapter 11 Responsibility and liability of the engineer. 11.2 Responsibility of the engineer towards the employer. 11.3 Responsibility of the engineer towards the contractor. 11.3.1 In the common law countries. 11.3.2 In the Romano-Germanic system. 11.4 The responsibility of the engineer towards third parties (other than the contractor). 11.5 The responsibility of the engineer towards society; employees; and the engineer himself. Chapter 12 The employer's obligations. 12.2 Identification of specific elements of the project. 12.5 To provide instructions as and when they are required. 12.6 The employer is to refrain from taking any action which would impede or interfere with the progress of the works. 12.7 The employer if to supply materials and carry out works if these form part of the work as defined in the contract. 12.8 The employer is to nominate specialist sub-contractors and suppliers as and when they are required. 12.9 To permit the contractor to carry out the whole of the works. 12.10 To make payments and to make them on time. 12.11 Additional obligations for the employer under the Fourth Edition of the Red Book. Chapter 13 The contractor's obligations. 13.2 The contractor's obligations during the tendering stage. 13.3 The contractor's obligations following the letter of acceptance and during the construction stage up to substantial completion. 13.3.1 Finalising documentation required prior to commencement of the works. 13.3.2 Construction and completion of the works with due diligence and within the time for completion. 13.3.3 Use of materials, plant and workmanship. 13.3.4 Provision of securities, indemnities and insurances. 13.3.5 Supply of information, notices or alerts. 13.3.6 Performance of certain administrative functions. 13.4 Contractor’s obligations after substantial completion of the works. Chapter 14 Risks, liabilities, indemnities and insurances. 14.2 The Red Book provisions relating to risk, responsibility, liability, indemnity and insurance. 14.3 Clause 20 of the Red Book – '20.1: care of the works'; '20.2: responsibility to rectify loss or damage'; '20.3: loss or damage due to employer's risks'; and '20.4: employer's risks'. 14.3.1 Sub-clause 20.1: care of works. 14.3.2 Sub-clause 20.2: responsibility to rectify loss or damage; and sub-clause 20.3: loss or damage due to employer's risks. 14.3.3 Sub-clause 20.4: the employer's risks. 14.4 Clause 65 of the Red Book (sub-clauses 65.1 to 65.8) – special risks. 14.5 Clause 21 of the Red Book – insurance. 14.5.1 Importance of adequacy of cover. 14.5.2 Period of insurance and extent of cover. 14.5.4 Scope of insurance cover. 14.5.5 Provisions for payment in foreign currency. 14.6 Clause 22 of the Red Book – indemnity for damage to persons and property other than the works. 14.7 Clause 23 of the Red Book – third party insurance. 14.8 Clause 24 of the Red Book – injury to workmen and insurance. 14.9 Clause 25 of the Red Book – general insurance requirements. 14.10 Part II of the Red Book – insurance arranged by the employer. Chapter 15 Performance and other securities. 15.2 The spectrum of securities. 15.4 Characteristics of performance bonds and guarantees. 15.5 The ICC Uniform Rules for Demand Guarantees. 15.6 Uniform Rules for Contract Bonds. 15.7 Insurance against unfair calling. 15.8 Performance securities under the Red Book. 15.9 Examples of securities provided. 15.10 Other securities associated with a construction contract. 15.10.1 Bid bonds or guarantees. 15.10.4 Maintenance or defects liability bonds. Chapter 16 Claims and counterclaims. 16.2 Definition and legal basis of claims and counterclaims. 16.3 Claim based on grounds of breach of contract. 16.3.3 Adverse physical obstructions or conditions. 16.3.5 Compliance with statutes, regulations, price fluctuations, currency and other economic causes. 16.3.6 Defects and unfulfilled obligations. 16.3.7 Failure to commence, delays, suspension of work, release from performance, default and termination. 16.3.8 Other miscellaneous specified events. 16.4 Claim based on grounds of breach of contract. 16.5 Procedure for claims for additional payment – clause 53. 16.6 The presentation of claims. 16.8 Failure to follow the claims procedure. Chapter 17 Delay in completion and claims for extension of time. 17.1 Time is of fundamental importance. 17.2 Clauses 43, 44, 46, 47 and 48 of the Red Book. 17.3 Relevant clauses of the Fourth Edition of the Red Book to an extension of time under Clause 44. 17.6 Claims for both extension of time & money. 17.7.1 Liquidated damages and penalties. 17.8 The Society of Construction Law 'Delay and Disruption Protocol'. Chapter 18 Certificates and payments. 18.6 The engineer is to certify a valuation at date of termination. Chapter 19 Disputes settlement by arbitration. 19.3 What is a dispute?. 19.6 Sources of law in arbitration. 19.6.2 The arbitration agreement as a source of law. 19.8 The arbitration agreement under clause 67 of the Red Book. 19.8.1 Procedure under clause 67. 19.9 The 1996 supplement to the Fourth Edition of the Red Book. 19.10 The ICC Rules of Arbitration. 19.10.2 The advantages of the ICC Rules. 19.11 Why does arbitration in construction disputes continue to lose favour?. Chapter 20 Amicable settlement using alternative dispute resolution. 20.2 Methods of dispute settlement. 20.3.2 Distinguishing features of direct negotiation. 20.3.3 When should negotiation be used and what are the steps?. 20.5.3 When should conciliation be used?. 20.5.4 Who should be a conciliator?. 20.5.5 Who should attend the conciliation?. 20.7 Dispute board, dispute review board and dispute adjudication board. 20.9 The ICC Rules for amicable dispute resolution. 20.11 The ICC Rules for expertise. 20.11.1 The Rules for expertise. 20.11.2 Functions of the ICC Centre for Expertise. Part IV Other Documents Related to the Red Book. Chapter 21 FIDIC’s other forms of contract. 21.2 The Yellow Book, third edition. 21.2.2 Differences in the nature of civil engineering and E & M engineering projects. 21.2.3 Essential features of the Yellow Book. 21.3 The Orange Book, first edition. 21.3.2 Differences in the nature of the Red and Yellow Books on the one hand and the Orange Book on the other. 21.4 The conditions of subcontract for works of civil engineering construction. 21.4.2 Clause 1, definitions and interpretation. 21.4.3 Clause 4, 'main contract'. 21.4.4 Clause 13 and 15, 'indemnities; insurances'. 21.4.6 Clause 19, 'settlement of disputes'. 21.5 Other publications of FIDIC. Part V The 1999 Red Book; The 1999 Yellow Book; The 1999 Silver Book; The 1999 Green Book; Dispute Boards. 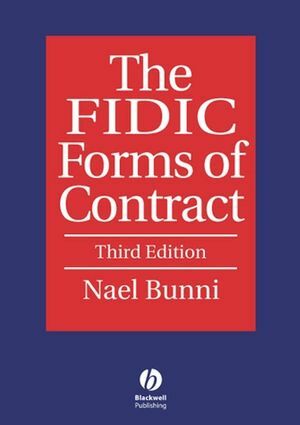 Chapter 22 The 1999 FIDIC suite of contracts. 22.4 The 1999 Green Book. Chapter 23 The 1999 Red Book. 23.2 The 1999 Red Book: concepts and content. 23.3 The 1999 Red Book: new concepts. 23.3.1 Sub-clause 1.12: confidential details. 23.3.2 Sub-clause 2.4: employer's financial arrangements. 23.3.3 Sub-clause 2.5: employer's claims. 23.3.4 Clause 3: the engineer. 23.3.5 Sub-clause 4.1(c): fitness for purpose. 23.3.6 Sub-clause 4.2: performance security. 23.3.7 Sub-clause 4.12: unforeseeable physical conditions. 23.3.8 Sub-clause 4.21: Progress reports. 23.3.9 Sub-clause 13.2: value engineering. 23.3.11 Sub-clause 14.8: delayed payment. 23.3.12 Sub-clause 15.5: employer's entitlement to termination. 23.3.13 Clause 17: risk and responsibility. 23.3.14 Sub-clause 17.6: limitation of liability. 23.3.16 Clause 19: force majeure. 23.3.18 Clause 20:Sub-clauses 20.2 to 20.4 – Appointment of the dispute adjudication board; failure to agree dispute adjudication board; and obtaining dispute adjudication Board's decision. 23.4 Some highlights of the 1999 Red Book. 23.4.2 Clause 2: the employer. 23.4.3 Clause 4: the contractor. 23.4.4 Clause 6: Staff & Labour. 23.4.5 Clause 7: Plant, Materials and workmanship. 23.4.6 Clause 8: commencement, delays and suspension. 23.4.7 Clause 9: tests on completion. 23.4.8 Clause 10: employer's taking over. 23.4.9 Clause 11: defects liability. 23.4.10 Clause 12: measurement and evaluation. 23.4.11 Clause 13: variations and adjustments. 23.4.12 Clause 14: contract price and payment. 23.4.13 Clause 15: Termination by employer. 23.4.14 Clause 16: Suspension and termination by contractor. 23.4.15 Clause 20: sub-clauses 20.7 – Failure to comply with dispute adjudication board's decision. 23.4.16 Guidance for the preparation of particular conditions. Chapter 24 The 1999 Yellow Book. 24.2 Tendering under, and using, the 1999 Yellow Book. 24.3 The 1999 Yellow Book: The employer's requirements. 24.3.1 Sub-clause 1.1.3.4 'tests on completion'. 24.3.2 Sub-clause 1.1.3.6 'tests after completion'. 24.3.4 Sub-clause 1.1.6.9: definitions – 'valuation'. 24.3.5 Sub-clause 1.5: general provisions – 'priority of documents'. 24.3.6 Sub-clause 1.8: 'care and supply of documents'. 24.3.7 Sub-clause 1.9: General provisions – 'errors in the employer's requirements'. 24.3.8 Sub-clause 1.11: general provisions – 'contractor's use of employer's documents'. 24.3.9 Sub-clause 1.13: general provisions – 'compliance with laws'. 24.3.10 Sub-clause 2.1: the employer – 'right to access to the site'. 24.3.11 Sub-clause 4.1: the contractor – 'contractor’s general obligations'. 24.3.12 Sub-clause 4.6: The contractor – 'co-operation'. 24.3.13 Sub-clause 4.7 'setting out'. 24.3.14 Sub-clause4.18: the contractor – 'protection of the environment'. 24.3.15 Sub-clause 4.19: the contractor – 'electricity, water and gas'. 24.3.16 Sub-clause 4.20: the contractor – 'employer's equipment and free-issue material'. 24.3.17 Sub-clause 5.1: design – 'general design obligations'. 24.3.18 Sub-clause 5.2: Design - 'Contractor’s Documents'. 24.3.19 Sub-clause 5.4: Design - 'Technical Standards and Regulations'. 24.3.20 Sub-clause 5.5: Design - 'Training'. 24.3.21 Sub-clause 5.6: Design - 'As-Built Documents”. 24.3.22 Sub-clause 5.7: Design - 'Operation and Maintenance Manuals'. 24.3.23 Sub-clause 6.1: Staff and Labour - 'Engagement of Staff and Labour'. 24.3.24 Sub-clause 6.6: Staff and Labour - 'Facilities for Staff and Labour'. 24.3.26 Sub-clause 7.8: Plant, Materials and Workmanship - 'Royalties'. 24.3.27 Sub-clause 8.2 'Time for Completion'. 24.3.28 Sub-clause 8.3: Commencement, Delays and Suspension - 'Programme'. 24.3.29 Sub-clause 9.1: Tests on Completion - 'Contractor’s Obligations'. 24.3.30 Sub-clause 10.2 'Taking Over of Parts of the Works'. 24.3.31 Sub-clause 11.1 'Completion of Outstanding Works and Remedying Defects'. 24.3.32 Sub-clause 17.5: Risk and Responsibility - 'Intellectual and Industrial Property Rights'. 24.4 Comparison between the 1999 Yellow Book and the 1999 Red Book. 24.4.1 Clause 1: General Provisions. 24.4.2 Clause 3: The Engineer. 24.4.3 Sub-clause 4.1: The Contractor- 'Contractor’s General Obligations' 24.4.4 Sub-clause 4.4 'Subcontractors', sub-clause 4.5 'Nominated Subcontractors' and sub-clause 4.6 'Co-operation'. 24.4.6 Sub-clause 7.5: Plant, Materials and Workmanship - 'Rejection'. 24.4.7 Sub-clause 8.3: Commencement, Delays and Suspension - 'Programme'. 24.4.8 Sub-clause 9.1: Tests on Completion – 'Contractor's Obligations'. 24.4.9 Sub-clauses 11.2 and 11.6: Defects Liability – 'Cost of Remedying Defects and Further Tests' and 'Further Tests'. 24.4.10 Clause 12: Tests after Completion. 24.4.11 Sub-clauses 13.1; 13.2; and 13.3: Variations and Adjustments – 'Right to Vary', 'Value Engineering', and 'Variation Procedure'. 24.4.12 Sub-clauses 14.1; 14.3; and 14.9: Contract Price and Payment – 'The Contract Price'; 'Application for Interim Payment Certificates' and 14.9 'Payment of Retention Money'. 24.4.13 Sub-clause: 17.5: Risk and Responsibility - 'Intellectual and Industrial Property Rights'. 24.4.14 Clause 20.2: Claims, Disputes and Arbitration – 'Appointment of the Dispute Adjudication Board'. Chapter 25 The 1999 Silver Book. 25.2 The 1999 Silver Book: The Shifted Risks. 25.2.1 Sub-clause 3.1: The Employer’s Administration – 'The Employer’s Representative”. 25.2.2 Sub-clause 3.5: The Employer's Administration - 'Determinations'. 25.2.3 Sub-clause 4.7: The Contractor – 'Setting Out'. 25.2.4 Sub-clause 4.12: The Contractor – 'Unforeseeable Difficulties'. 25.2.5 Sub-clause 5.1: Design – 'General Design Obligations'. 25.2.6 Sub-clause 5.8: Design – 'Design Error'. 25.2.7 Sub-clause 8.4: Commencement, Delay and Suspension – 'Extension of Time for Completion'. 25.2.8 Sub-clause 17.3: Risk and Responsibility – 'Employer’s Risks'. 25.2.9 Sub-clause 20.1: Claims, Disputes and Arbitration – 'Contractor’s Claims'. 25.3 The 1999 Silver Book: Concepts and Content. 25.3.1 Clause 1: General Provisions. 25.3.2 Clause 3: the Employer's Administration. 25.3.3 Clause 4: The Contractor. 25.3.5 Clause 6: Staff and Labour. 25.3.6 Clause 7: Plant, Materials and Workmanship. 25.3.7 Clause 8: Commencement, Delays and Suspension. 25.3.8 Clause 9: Tests on Completion. 25.3.9 Clause 10: Employer's Taking Over. 25.3.10 Clause 11: Defects Liability. 25.3.11 Clause 12: Tests after Completion. 25.3.12 Clause 13: Variations and Adjustments. 25.3.13 Clause 14: Contract Price and Payment. 25.3.14 Clause 15: Termination by Employer. 25.3.15 Clause 16: Suspension and Termination by Contractor. 26.2 Main advantages of the Dispute Board. 26.4 Types of Dispute Boards. 26.5 Varieties of Dispute Boards. 26.6 Dispute Adjudication Boards under the FIDIC Contracts. 26.7 The role of the Dispute Adjudication Board. 26.8 Establishment of the Dispute Adjudication Board. 26.9 Obligations of the Parties and the Members of the Dispute Adjudication Board. 26.10 Powers of the Dispute Adjudication Board. 26.11 Procedures relating to site visits & meetings. 26.12 Procedures relating to referral of a matter to the Board for its opinion. 26.13 Procedures relating to referral of a dispute to the Board for its decision. 26.14 Remuneration of the members of the Dispute Adjudication Board. 26.15 Cost of maintaining the members of the Dispute Adjudication Board. 26.16 The decision of the Dispute Adjudication Board. Part VI Comparison between the text of the three 1999 Major Books: Red, Yellow and Silver Books. Chapter 27 A precise record of the Alterations, Omissions and Additions in the 1999 Yellow & Silver Books as compared with the 1999 Red Book. 'One of the great virtues of the book is that it is almost a work on construction law and practice in the international sphere....It is quite common for books to be described as indispensable but that is an apt description of what looks to be a classic text. It is also remarkably good value for money.' Judge Humphrey Lloyd QC, International Construction Law Review, 2005.